TALLAHASSEE, FL - The Manufacturers Association of Florida (MAF) awarded Governor Rick Scott, Senator Dorothy Hukill, and Representative MaryLynn Magar with the Manufacturing Legislative Excellence Awards following the Annual Manufacturing Summit on November 17, 2016. The award is given to state leaders and legislators who consistently support MAF’s mission of improving the business climate for Florida manufacturers. TALLAHASSEE, FL. — The 13th Annual Manufacturers Summit and Marketplace is being held on November 15-17, 2016 in Gainesville, Florida to acknowledge the progressive achievements in Florida’s manufacturing industry. As the climax of the event, the Manufacturers Association of Florida will recognize and honor Florida’s top manufacturing and distribution companies. Throughout late spring, dozens of nominations were accepted for distinguished manufacturers and distributors across the state of Florida. A team of fourteen judges, selected for their intimate knowledge of the industry and track records of successful ventures, evaluated each nominee on leadership, strategic planning, customer and market focus, measurement, analysis and knowledge management, workforce focus, and operation focus. At the conclusion of the initial evaluation, twelve companies were selected as finalists in four distinct categories. Those companies that are both MAF members and finalists will also be granted MAF’s Seal of Excellence for 2016. The annual awards ceremony will take place during the President’s Dinner on November 16 in Gainesville, Florida. Event tickets may be purchased at www.MAFMFG.com. Tallahassee, FL – The Manufacturers Association of Florida (MAF) and the Gainesville Area Chamber of Commerce are excited to announce the 2016 Annual Manufacturers Summit & Marketplace to be held November 15-17, 2016 in Gainesville, Florida. The annual event—which is being hosted this year by the Chamber’s Advanced Manufacturing Council—will provide a forum for discussion and action in several areas focal to the industry, including the future of manufacturing in Florida, the effects of disruptive technologies on business, the future of Florida’s manufacturing workforce, and efforts in collaboration with industry leaders to engage young professionals and educate teens on manufacturing careers. “The global manufacturing industry is entering a paradigm-shifting era of change in which Florida is poised for leadership,” said MAF President Al Stimac. “As we look to the future, MAF is focused on preparing Florida’s more than 19,400 manufacturers and the 353,000 Floridians they employ to lead this industry renaissance with innovation, ingenuity and a focus on technology." This year’s program features a roster of dynamic speakers on topics ranging from technologies of the future to incoming generations of student manufacturers. The Summit’s keynote speaker, Tom Morrison, has served as the CEO of the Metal Treating Institute since 2008. As an affiliate of the National Association of Manufacturers, Tom has invested his time in educating the industry on preparing for and thriving in the future. His work in disruptive technologies not only creates an awareness of looming threats but creative solutions for tackling the unknown and succeeding on the edge of innovation. Attendees at the MAF Annual Summit & Marketplace can look forward to perspectives from Morrison and other speakers on industry, business and economic trends. For more information on the MAF Annual Summit & Marketplace, visit www.mafmfg.com/2016-annual-summit-marketplace. TALLAHASSEE, Fla. – The Manufacturers Association of Florida (MAF) recognizes Governor Scott’s unwavering support of the manufacturing industry by signing the permanent sales tax exemption on manufacturing machinery and equipment in the Tax Package (HB 7099). The measure, which is included in House Bill 7099, was originally sponsored by Senator Dorothy Hukill and Representative MaryLynn Magar. The manufacturing industry employs more than 341,000 Floridians with an average annual salary of $55,520. Over the past 60 consecutive months, MAF has witnessed the creation of new jobs within the industry and the permanent sales tax exemption on manufacturing machinery and equipment will allow this trend to continue. 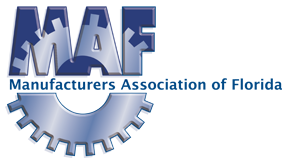 TALLAHASSEE, Fla. – The Manufacturers Association of Florida (MAF) applauds the Florida Senate and the House of Representatives on the final passage of the permanent sales tax exemption on manufacturing machinery and equipment. The measure, which is included in House Bill 7099, was originally sponsored by Senator Dorothy Hukill and Representative MaryLynn Magar. MAF wishes to thank Governor Scott, President Gardiner, Speaker Crisafulli, President Lee, Speaker Designate Corcoran, Sen. Hukill, Rep. Gaetz, Rep. Ray Rodrigues, and Rep. Magar for the critical roles they all played in passing this cornerstone legislation on manufacturing. Tallahassee, FL – The Manufacturers Association of Florida (MAF) announces the 2016 officer election results, following an association vote. Abe Alangadan, Business Unit Manager, Johnson & Johnson Vision Care Inc.
TALLAHASSEE, Fla. – The Manufacturers Association of Florida (MAF) applauds the House Finance and Tax Committee for including the permanent sales tax exemption on manufacturing machinery and equipment, along with a reduction in business rent tax, in the Committee’s proposed tax package. TALLAHASSEE, Fla. – The Manufacturers Association of Florida (MAF) and the Florida Medical Manufacturers Consortium (FMCC) applaud the Senate Finance and Tax Committee for voting favorably on SB 98, Sales Tax Exemption for Manufacturing Machinery and Equipment. The bill, sponsored by Senator Hukill, will make permanent the temporary sales tax exemption for manufacturing machinery and equipment. The Manufacturers Association of Florida (MAF) applauds the Senate Commerce and Tourism Committee for passing SB 98, Sales Tax Exemption for Manufacturing Machinery and Equipment. The bill, sponsored by Senator Dorothy Hukill, will make permanent the temporary sales tax exemption granted on manufacturing machinery and equipment in 2014. The Cut My Rent 1 Percent coalition today announced an ad campaign encouraging the Florida Legislature to support cutting the Business Rent Tax. The ads, which will air on Florida broadcast and cable TV and the Internet beginning next week, urge business owners to contact their legislators asking them to support Florida’s job creators by supporting a 1 percent cut in the Business Rent Tax. MAF, among other organizations, is a proud coalition member and we are working diligently to cut the business rent tax by 1%.